A new Federal Highway Administration program offers resources to State Transportation Innovation Councils to support their efforts to mainstream innovations under the Every Day Counts initiative. STICs, led by the highway agency head and FHWA division administrator in each state, have been instrumental in bringing together transportation stakeholders to identify and implement Every Day Counts innovations. They include members from local agencies, regulatory agencies, Local Technical Assistance and Tribal Technical Assistance Programs, metropolitan planning organizations and industry. The STIC Incentive Program offers technical assistance and funds—up to $100,000 per STIC per year—to support the costs of standardizing innovative practices in a state transportation agency or other public sector STIC stakeholder. It's part of the Moving Ahead for Progress in the 21st Century Act. “For states, using available, proven innovations is essential to delivering the transportation programs motorists and taxpayers expect today. This incentive program is designed to help cover some of the costs involved in adopting and regularly using innovations that can improve our transportation system,“ said Hari Kalla, director of FHWA's Center for Accelerating Innovation, which administers the program. A total of $5.3 million per fiscal year is available for STIC incentives, which will be for the 80 percent federal share of transportation project funding. The non-federal match must come from project sponsors or other allowable funding sources. STIC incentives can be used for a variety of activities to make innovations standard practice in a state, including developing technical guidance and standards, implementing system process changes, organizing peer exchanges, delivering training, creating an evaluation plan and offsetting the costs of innovation deployment. Projects selected for incentives will be those with a statewide impact on making an innovation a standard practice. The application process involves submitting a short document to the state FHWA division office with a description of the proposed work, amount of funds requested, project schedule, other committed funding sources and the public entity responsible for administering the project. FHWA introduced the concept of STICS in 2010 when it launched Every Day Counts, which works with states to implement innovations that reduce the time it takes to deliver highway projects, enhance safety and protect the environment. Today all 50 states, the District of Columbia and Puerto Rico have STICS in some format that encourage innovation and cooperation among transportation stakeholders. 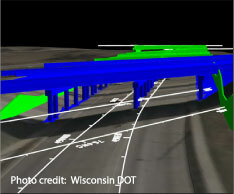 A county official from Illinois who picked up the idea of 3-D modeling at an Every Day Counts seminar is now using the technology to save time and money on a road reconstruction project in his state. In recent years, many contractors have begun using Global Positioning System technology to provide automated machine control on their construction equipment. For example, GPS technology can show a bulldozer operator a display in the cab that illustrates the desired design grade, using a 3-D digital terrain model. By comparing the actual grade to the design grade, the GPS system can automatically control the dozer blade or the blade of any construction machine. The use of GPS and 3-D modeling technology virtually eliminates the need for grading stakes and real-time surveying and significantly reduces the time it takes equipment operators to accomplish their grading. “The real savings is in the surveying,” said Loren Rains, project engineer for Brandt Construction Co. of Milan, Ill., contractor for the County Highway 4 project. The $4.9 million project involves shaping a new profile for more than 3 miles of the two-lane county road. Some 40,000 cubic yards of earth must be moved from cuts to fills or excavated from a borrow pit on the project. Brandt will have one GPS-equipped dozer pushing earth to a large excavator, which will load off-road trucks. The dozer's GPS system will tell the operator at the cut exactly when final grade has been reached. The process works much the same way at the fill site, where trucks dump the earth and a GPS-controlled dozer spreads it out. “We'll use the GPS systems for grading and shaping the ditches, and then for subgrade purposes and for grading and placing the base stone,” said Rains. “If the 3-D model and GPS systems can help us get in and get out of the construction area quicker, certainly that’s less in-convenience for the traveling public,” said Ratermann. “And accuracy is one of the benefits of the 3-D model. You have a computer that determines the elevation of the dozer blade as opposed to a human being reading from grade stakes.” For more information on 3-D modeling, visit: /innovation/everydaycounts/edc-2/3d.cfm. Knox County has closed County Highway 4 for the duration of the project. Completion is scheduled for May 2015, but Rains hopes to beat that date. “If we get decent weather and everything goes according to plan, I'd estimate that we could finish by Thanksgiving of 2014,” he said. Crews pour concrete for a box culvert that is part of the County Road 4 project where 3-D modeling is being used instead of surveying stakes. 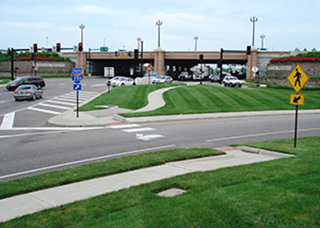 Innovative intersection and interchange geometrics are gaining momentum across the country. The Federal Highway Administration is promoting them through its Every Day Counts initiative to accommodate traffic volumes more efficiently while enhancing safety for motorists, pedestrians and bicyclists. These proven techniques increase the safety of intersections—where about half of the nation's severe crashes occur—by eliminating or relocating left-turn conflicts that can cause problems. FHWA recommends that highway agencies include these designs in their evaluation processes for intersection projects and use them where appropriate. The diverging diamond interchange eliminates the signalized left-turn phase at the two intersections in the interchange by shifting the cross-road traffic to the left side of the road between the ramp terminals. This enhances safety by reducing the number of traffic conflict points and improves traffic flow by decreasing the number of signal phases. The displaced left turn intersection enhances safety and operations by eliminating the main intersection conflict between left-turning vehicles and oncoming traffic. Left-turning traffic makes a coordinated signalized turn before the main intersection into left-turn bays on the opposite side of oncoming traffic. U-turn intersections are a family of intersection geometrics that share a similar strategy for using indirect left turns. Those promoted through Every Day Counts include the restricted crossing U-turn intersection, sometimes called a J-turn, the median U-turn intersection and the ThrU-turn intersection. These strategies boost safety and improve traffic flow by eliminating, relocating or modifying intersection conflict points. The modern roundabout is a circular intersection in which traffic travels counterclockwise around a central island and entering traffic yields to circulating traffic. It improves safety by replacing perpendicular crossings and opposing direction turns with low-speed merging and diverging maneuvers. Examples of these geometrics abound, said Mark Doctor, safety and design engineer at FHWA's Resource Center. The Salt Lake City, Utah, area has the greatest concentration of the four designs: four diverging diamond interchanges, eight displaced left turn intersections, numerous roundabouts, several ThrU-turn intersection applications and more in the works. Missouri has the most diverging diamond interchanges, with 10 in place and more in development, Doctor said. The state also has numerous roundabouts, several restricted crossing U-turn intersections and one displaced left turn intersection. Maryland, another leader in implementing these designs, was an early user of the displaced left turn intersection. The state also has several restricted crossing U-turns along the U.S. 301 corridor, numerous roundabouts and a recently built diverging diamond interchange. Missouri has more diverging diamond interchanges than any other state, including one in Maryland Heights at I-279 and Dorsett Road. (right) A restricted crossing U-turn intersection is enhancing safety on U.S. 53 and County Road B in Wisconsin's Douglas County. A workshop on Alternative Intersections and Interchanges (FHWA-NHI-380109) is aimed at state and local agency professional staff. It covers applicability criteria, safety performance, design, access management, pedestrian and other considerations. Details are at www.nhi.fhwa.dot.gov. Technical assistance on analysis and design questions and peer reviews by experts involved with successful implementation are available. This on-call support for state and local agencies is handled mostly through email, conference calls and Web meetings. Help with applying the designs is also offered through peer-based information exchanges, which are tailored to the interests of participating agencies. Various formats—in person, virtual or a combination—are possible to accommodate participants' travel needs, Doctor said. FHWA encourages holding a forum as part of an already planned event. For information on obtaining technical assistance or scheduling a peer exchange, contact Mark Doctor at mark.doctor@dot.gov or (404) 562-3732. After three Technology Partnerships projects tested innovations to improve the way bridges are built, they showed that the technologies—precast bents for high seismic regions, composite decking and ultra-high-performance concrete waffle deck panels—work on real-world projects. The Technology Partnerships program provides grants to private industry to help transform late-stage prototypes that can cut construction congestion and enhance highway quality and safety into market-ready products. Under the program, part of the Federal Highway Administration's Highways for LIFE initiative, the innovations are further developed and evaluated on construction projects. Lightweight, corrosion-resistant composite bridge decking was tested on a project in New York. A Technology Partnerships grant helped BergerABAM Inc. of Federal Way, Wash., develop connections for prefabricated bridge bents used in areas prone to seismic activity. Precast elements can save time and boost safety on bridge projects, but using them in high seismic zones requires connections that are both readily constructible and able to withstand seismic shaking. The precast bent system evaluated under the project is configured for use with precast girder superstructures supported on cap beams constructed in two phases, with the lower stage placed first to support the girders and the upper stage built later to integrate the pier and superstructure. The system is adapted from a common type of pier construction used throughout the country. Past tests showed that seismic accelerated bridge construction technologies were feasible for upper-column to cap-beam connections. The Technology Partnerships project extended that work to the connections at the bottom of the column. 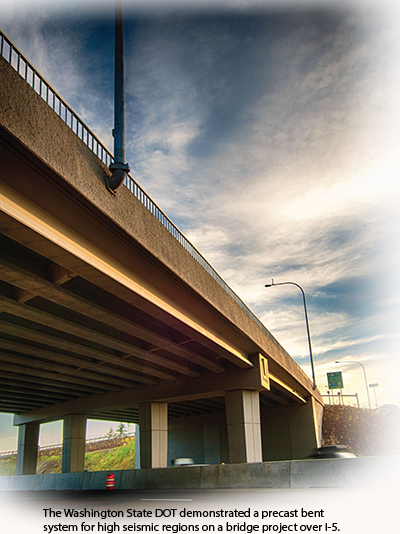 After researchers conducted proof testing of the lower connection, the Washington State Department of Transportation demonstrated the precast bent system on a bridge replacement project over Interstate-5. “The precast bent system improves safety during construction by reducing the time the contractor is on a congested job site, it improves safety after construction by using improved connections for seismic resistance, it reduces highway congestion in terms of reducing construction time, and overall it should improve infrastructure by providing better and more durable construction,” researchers reported in Precast Bent System for High Seismic Regions (FHWA-HIF-13-037), available at www.fhwa.dot.gov/hfl/partnerships/precast_bridge/hif13037. UHPC deck panels with a unique waffle shape were prefabricated for use on a bridge project in Iowa. Another Technology Partnerships project developed corrosion-resistant, lightweight bridge decking that can be installed quickly to minimize traffic disruption and improve safety. BridgeComposites LLC of Hornell, N.Y., used its grant to determine the best materials and methods to fabricate a composite bridge deck based on a New York State Department of Transportation prototype developed at the University at Buffalo. Under the project, the process used to fabricate the deck panels was improved and the strength and stiffness of the deck were validated with independent laboratory testing. Installation details were demonstrated on a project to replace the deck of a bridge in Allegany County, N.Y.
“The result of the project is a robust, high-quality deck suitable for many applications, including movable bridges, historic trusses and posted bridges,” according to Composite Bridge Decking: Final Project Report (FHWA-HIF-13-029), online at www.fhwa.dot.gov/hfl/partnerships/composite_bridge/hif13029. The initial material cost of the innovative deck is higher than conventional alternatives, but it can be a good option when its rapid installation offsets the cost of maintenance of traffic, the report said. It's also helpful when light weight is especially important, such as on deteriorated or historic structures. In a third bridge-related project, Coreslab Structures (Omaha) Inc. of Bellevue, Neb., manufactured, tested and demonstrated the use of full-depth bridge deck panels made of UHPC. The panels were strategically designed with a “waffle” shape, reducing the volume of UHPC and the associated cost. The project's first phase included the design and testing of a mock-up bridge section to verify design assumptions and evaluate the feasibility of manufacturing and installing the deck elements. In phase two, the panels were used on a two-lane bridge in Wapello County, Iowa. It was the nation's first bridge project to use UHPC, which is more durable than conventional concrete, in modular deck panels. “Overall, the project has been a successful experience, and invaluable knowledge has been gained relating to the application of UHPC in bridge construction,” researchers noted in The Implementation of Full-Depth UHPC Waffle Bridge Deck Panels (FHWA-HIF-13-031), at www.fhwa.dot.gov/hfl/partnerships/uhpc/hif13031. 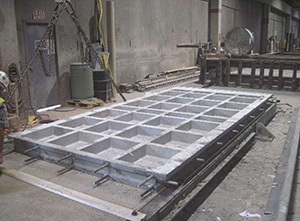 Using lessons learned from the project, researchers developed Design Guide for Precast UHPC Waffle Deck Panel System, Including Connections (FHWA-HIF-13-032), which provides details on designing, fabricating and installing the deck panels. It's available at www.fhwa.dot.gov/hfl/partnerships/uhpc/hif13032. For more information on Technology Partnerships, visit: www.fhwa.dot.gov/hfl/partnerships. States are adding safety innovations, accelerated bridge construction techniques and new project delivery methods to their infrastructure-building toolkits. The Delaware Department of Transportation is embracing the use of high-friction surface treatments to improve safety. The agency's first treatment was on a horizontal curve with a history of wet weather roadway departure crashes. The Delaware DOT plans to continue to use the treatments to address roadway departure crashes in horizontal curves and advertise for a statewide contract for applying them. The Federal Highway Administration helped the agency develop technical specifications for the contract. A showcase in Dupuyer highlighted Montana's first geosynthetic reinforced soil integrated bridge system. The bridge crosses the South Fork Dry Fork Marias River and consists of GRS abutment walls with prestressed, voided-slab beams. The bridge is designed as a grizzly bear undercrossing. Nearly 40 people from county, state and federal agencies and private industry attended a workshop and site visit to learn about GRS-IBS. The Virginia Department of Transportation is using the design-build delivery method on three restoration projects on the I-64 and I-264 corridors in the Chesapeake, Norfolk and Virginia Beach areas. The projects—estimated to cost $116 million—will increase pavement life span on the interstate sections 15 years or more. High-friction surface treatments will be applied on shoulders used as travel lanes to enhance safety. 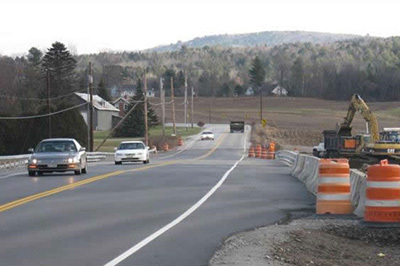 The New York State Department of Transportation used accelerated bridge construction to replace the I-84 overpass over Dingle Ridge Road in Putnam County. The project is a Highways for LIFE demonstration project and a second Strategic Highway Research Program ABC Toolkit pilot. In September, I-84 eastbound was closed one weekend so the new bridge structure could be slid into place, while the westbound bridge slide took place during another weekend closure to minimize disruption to motorists. The Ohio Department of Transportation demonstrated the use of intelligent compaction—which improves pavement quality and performance—on clay soils on a project in Lima. Subgrade compaction was done with a Cat Machine Drive Power roller, then evaluated with a nuclear moisture density gauge, lightweight deflectometer and dynamic cone penetrometer. The agency plans a similar project demonstration on granular material in Belmont County. A Vermont Agency of Transportation project on a rural road near East Montpelier showed that using accelerated bridge construction techniques can benefit small bridge projects as well as big ones. The project to replace a narrow, functionally obsolete bridge on U.S. 2 over the Winooski River with a wider, safer structure received a Highways for LIFE grant from the Federal Highway Administration because of its use of innovations. Among them was ABC, part of FHWA's Every Day Counts initiative to shorten project delivery time. The new, wider structure of a rural bridge in Vermont is expected to enhance traveler safety. 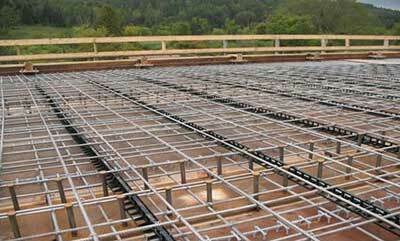 Stainless steel deck reinforcement increased the bridge's durability. “With no joints that can fall into disrepair and leak, no curbs that retain salt-laden runoff and accelerate deck deterioration, no bearings that can corrode and freeze and no beam paint system that can fail, the project accomplished its goal of designing and building a structure that is reduced to its most basic components, incorporates durable materials, is virtually maintenance free and has lower life cycle costs than a conventional structure,” noted an FHWA report, Vermont Demonstration Project: Route 2—East Montpelier Bridge. The Vermont Agency of Transportation estimated that the innovative approach saved eight weeks of construction time over conventional methods, which would have taken 176 days. Because of the temporary bridge, motorists experienced no significant traffic delays during construction, even though the speed limit through the work zone was reduced from 50 to 35 miles per hour. That meant the project met Highways for LIFE goals for construction congestion. No traffic incidents or worker injuries were reported during the project, so it met the Highways for LIFE safety goals. The wider structure is expected to be safer than the old bridge, the site of numerous collisions and near misses in the past. Motorists notice a quieter, smoother ride on the new bridge, although the project fell short of the Highways for LIFE noise and smoothness goals. Most motorists surveyed said they were satisfied with the finished bridge—96 percent—and the way the project was carried out—86 percent—so it met the Highways for LIFE goal for customer satisfaction. An economic analysis of the project—including the costs of construction and projected maintenance needs—showed that the innovative approach will save $932,800 over the life of the bridge compared to the traditional approach. That's a net savings of 47 percent. “The project saved money and demonstrates that the Highways for LIFE program concepts apply not only to large, complex bridge projects, but also to smaller, rural projects,” the FHWA report said. To read the Vermont report and other technical reports on Highways for LIFE demonstration projects, go to www.fhwa.dot.gov/hfl/projects. Accelerated bridge construction, innovative intersection geometrics, design-build contracting and alternative technical concepts are proving their worth. They're among the innovations states used on construction projects named finalists in the 2013 America's Transportation Awards competition. Of the top 10 projects in the annual competition sponsored by the American Association of State Highway and Transportation Officials, AAA and the U.S. Chamber of Commerce, five—including the two winners—used innovations from the Every Day Counts roster to cut congestion, provide greater mobility and improve safety. “The America's Transportation Awards competition was created to highlight all that our state transportation departments do each day to deliver quality, impactful transportation projects ahead of schedule, under their projected budgets and through exceptional innovation,” said Bud Wright, AASHTO executive director. The Utah Department of Transportation, which earned the Grand Prize, used innovative scheduling and planning techniques on its $1.7 billion I-15 corridor expansion project to finish two years ahead of schedule while saving taxpayers $260 million. The expanded roadway relieves congestion for motorists traveling to and from Salt Lake City and Provo. Using accelerated bridge construction, wireless paving and grading, and diverging diamond interchanges reduced traffic impact on motorists who travel through the I-15 CORE every day. Missouri's $685 million Safe and Sound Bridge Improvement Program finished more than 800 bridge projects across the state more than a year ahead of schedule, greatly improving safety for those who travel over them every day. The Missouri Department of Transportation, which won the People's Choice Award, identified 250 of the bridges as rehabilitation projects, while the rest were completed under a design-build contract. The Georgia Department of Transportation saved motorists' commute time and improved safety with its $6 million I-285/Ashford Dunwoody interchange project. A study showed the interchange had a high collision and fatality rate compared to similar interchanges, so the agency built a diverging diamond interchange to combat the problem, the first DDI in the state. The North Carolina Department of Transportation's $1 billion Triangle Expressway is the first in the state—and one of the first in the nation—to use all-electronic tolling technology on an expressway, allowing motorists to breeze through without having to stop at toll plazas. The accelerated design-build process and right-of-way acquisition process allowed the team to open the expressway to traffic ahead of schedule. The design-build process enabled the Rhode Island Department of Transportation to come in ahead of schedule and under budget on its $24.9 million multimodal transportation hub in Kingstown, which includes a new siding track, parking garage, drop-off area for cars and buses, bike parking and electric car charging stations. Design-build also resulted in project enhancements, such as the mill building façade, which was made possible by cost savings on alternative technical concepts offered in the design-build team's technical proposal. Learn more about America's Transportation Awards at www.americastransportationawards.org. Georgia's first diverging diamond interchange made the finals of the 2013 America's Transportation Awards competition. About 75 transportation professionals turned out to watch as crews slid a prebuilt bridge superstructure into place overnight on Interstate 84 near Echo, Utah. They also attended a workshop sponsored by the Utah Department of Transportation and the Federal Highway Administration to learn about the accelerated bridge construction techniques used to cut construction time and traffic impacts on the replacement project. It was the Utah DOT's first use of geosynthetic reinforced soil integrated bridge system technology, which combines alternating layers of compacted granular fill and geotextile reinforcement to support bridges. It was also the first time GRS-IBS had ever been used on a U.S. interstate.